Sometimes, work trips take me someplace new... and a couple of weeks ago, that meant SEATTLE! Yes, Seattle in December... rainy and chilly, just as I expected. I arrived around lunchtime, grabbed a bite, then worked a bit. But then my coworkers and I met up to see the Space Needle, which is probably one of the most touristy things you can do there! Even though it was cold and rainy, the view was incredible! I couldn't see the mountains, but it was still pretty stunning. We were meeting a couple blocks from the Public Market, so one morning I walked there on my way to meetings. It was kind of nice being there before everything opened up and the tourist deluge began. 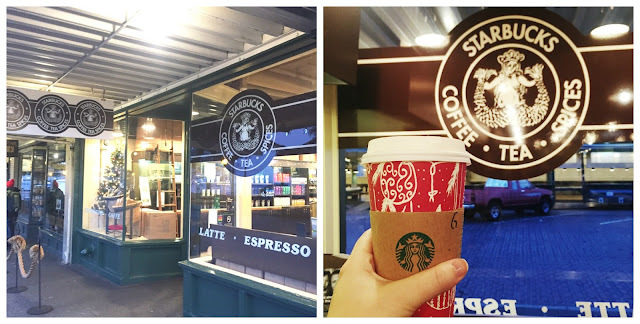 In fact, I was there so early, there was no line at the original Starbucks store! I don't drink coffee... I'm a tea girl. I do enjoy chai lattes, and in my youth I would chug a vanilla frappuccino. Dan is the coffee person. But since I was there, I got my chai latte and a souvenir mug to take home to Dan. It was kind of cool to say I've been there! I came back through the market during an evening walk too, and I got to see some of the fish and produce. It would be neat to live close enough to shop there regularly! I also indulged in DELICIOUS macarons at Le Panier. Seriously, so good. I'm a sucker for good macarons, and these were some of the best I've had! I'd like to spend a week in the Pacific Northwest with Dan. The sky seemed bigger out there! I even shopped at the Amazon Books store (like, a real store) and it was different in cool ways from what I'm used to seeing in bookstores. I did get out and enjoy food and nightlife too. 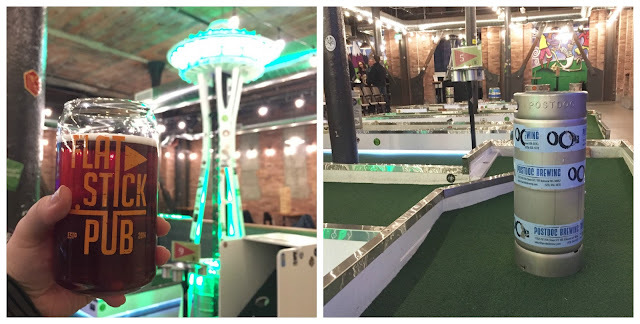 We played beer and Seattle-themed putt-putt at the Flatstick Pub, a cool bar that's kind of like an indoor adult fun zone with giant Jenga, trivia, etc. I indulged in a lot of comfort food too. Grilled cheese and tomato soup at The Lodge, pizzas at Serious Pie & Biscuit. 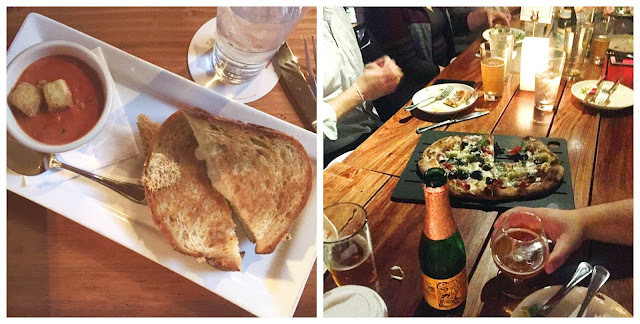 We also bar-hopped, hitting the great strip of spots on Ballard Ave. 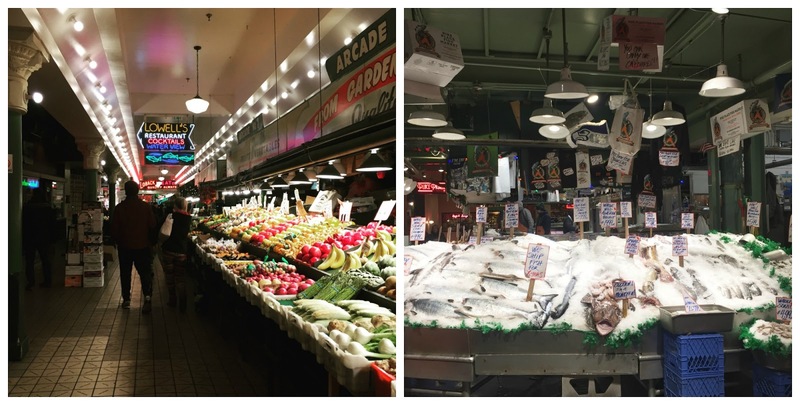 I hit up Ballard Loft, Macleod's Fish & Chips, and King's Hardware before I got tired and called it a night. I loved Seattle, despite the cold. Good food, good people, and a beautiful city! I think a week in Portland/Seattle would be a great vacay. What do you think?